And so here we are, at the start of 2018, and HTC has once again put to market a quality Android flagship. With an absolutely luxe all-glass body, tall and on-trend 18:9 screen, innovative Edge Sense squeeze-to-operate tech, and a suite of internal components that deliver massive power and performance, the HTC U11+ stands shoulder-to-shoulder with the big boys from Samsung and Apple and does so at a lower price point, too. And don't get us wrong, that's totally understandable. The phone has been released too late to make an impact, coming a full seven months after the Samsung Galaxy S8 Plus tore up 2017, and - tellingly - it's not been picked up by a single UK carrier. As such, while the HTC U11+ is available for less than rivals' phablet offerings, you'll have to buy it outright from HTC's online store, something that will no doubt price it out of a lot of people's budgets. And that's a massive shame, as the HTC U11+ is one of the most well-designed phone's T3 has had the pleasure of reviewing over the past year. And it proves that, despite its recent woes and fallow period in terms of market success, HTC really does know how to make a damn good Android phone. The first thing you notice when you take the HTC U11+ out of its unique, flat, white box is its all-glass body, which - and we pull no punches here - is absolutely gorgeous. It truly is a glass-backed beauty and when this stunning, wrap-around glass chassis is partnered with a Corning Gorilla Glass 5 screen, the results are simply breathtaking. HTC has completely knocked it out of the park here in terms of design. It's like a more stylish Samsung Galaxy S8 Plus. Strong opening. On the right-hand side of the device you have a sturdy volume rocker and, below it, a ridged power button. The HTC U11+'s Dual Nano SIM card slot is located on the top of the device, while its USB Type-C charging port and DisplayPort connector are located on the bottom of the handset. The sides of the phone are otherwise free of buttons and ports, asides from the unseen Edge Sense bars that, when squeezed, allow you to raise a dedicated Edge Sense app selector wheel, which from our testing period was super useful, or open an app or program of your own choosing, such as launching the phone's camera. And yes, you can even tailor the pressure required per squeeze to launch, meaning that accidental launches simply don't occur. Yes, the Edge Sense squeezing may be slightly gimmicky, but it is innovative and well realised nonetheless. In terms of internal hardware, the HTC U11+ certainly doesn't disappoint. Its Snapdragon 835 processor in partnership with a generous 6GB of RAM means that the phone flies, both in UI rapidity and app and game usage. Super smooth navigation and fast app loading is standard on the phone, and with a capacious 128GB of storage space, you can certainly stick a lot of software on it. The HTC U11+'s fingerprint scanner is located on the back of the device and during our testing period it was absolutely lightning fast. Simple, light presses, and at various different angles, lead to consistently fast unlocks, and it left us with zero anxiety over whether it would or wouldn't work. It just did what it was supposed to and immediately unlocked the phone. The lack of the scanner on the front of the device also means that the HTC U11 Plus's screen remains completely un-encroached upon. And the screen, asides from a very standard brightness range, is just fabulous. A 6-inch, 18:9 Quad HD+ beauty (that's a resolution of 2,880x1,440) that offers both a super luxe 82 per cent screen-to-body and, albeit by a upcoming firmware upgrade, support for HDR10, too. From viewing photos taken with the phone's camera, to watching Netflix, and onto playing games like Hearthstone, the HTC U11+'s screen really delivered. As we mentioned earlier, the only area we found it lacking was in terms of raw max brightness, which was very standard and made viewing things in direct sunlight a bit of a chore. The HTC U11+ uses the same quality camera that is found in the U11. This means you get a 12MP rear camera with OIS, EIS, and HDR Boost. The front camera is slightly tweaked, however. It remains 8MP but now has an 85-degree field of view and the same HDR Boost feature as on the rear. As with the U11, both these cameras are quality units and make taking good quality pictures easy. On test the HTC U11+ was easy to use, with quick focusing and sharp results on auto, and its Pro mode allows those with an understanding of camera settings to tweak to their heart's content. As evident in the sample images above, detail, colour and sharpness was top draw, while its low light performance (such as with the bowl of fruit) also pleasingly solid, something no doubt aided by the handset's optical and electronic image stabilisation. In terms of audio, HTC continues its pitch at music lovers, with support for 24-bit playback and a pair of noise cancelling in-ears in the box, however like most flagships today, it doesn't feature a headphone port. so it's USB-C or wireless via Bluetooth. From out testing with a pair of Focal Listen Wireless headphones, we were very pleased with the HTC U11+'s audio performance though, so we're confident this is a moot point. As we write this review the reveal of the Samsung Galaxy S9 range of phones, which almost certainly will include a S9 Plus phablet, is roughly six weeks out. And, what's more, that phone will most likely hit the market in March, meaning it is just a couple of months until there'll be a new major flagship on the market, and one that will not only outpower all existing phones, but could also bring with it some game-changing advancements. 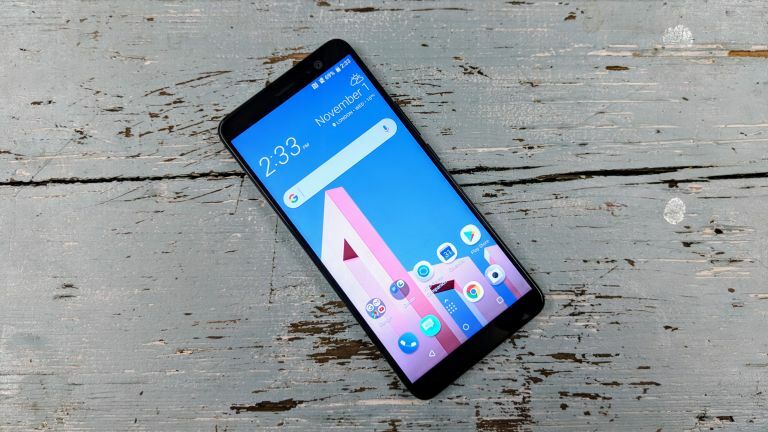 As such, even though we absolutely love the HTC U11+'s hyper-stylish looks, powerful performance, great camera, and suite of subtle but useful features, it is impossible for us to recommend it unreservedly, especially when - and it pains us to repeat this - it is not available through any UK carriers and other rival devices have offered a similar package for more than half a year. However, while we are confident that the HTC U11+ will make zero impact on the mainstream market, it does still offer a tantalising proposition for select enthusaist niches in the market and, naturally, will offer a large dollop of exclusivity, too, as simply put you aren't going to bump into many people with one. Its huge power means that the phone will not be rendered absolute quickly in the future, no matter what new mobile games and apps are released, and while its battery life isn't exactly something to write home about, we feel the average user will have no issues making it through a day or so either. Its camera is great by today's standards and, again, will provide years of happy snapping, while its design and form-factor are simply breathtaking. Phones in 2018 may deliver thinner and more lithe designs, however, there is a beautiful simplicity about the HTC U11+ that will look just as good in a couple of years as it does now in our opinion - just make sure you keep that all-glass chassis scratch and fingerprint free. Overall, then, a phone that could of absolutely rocked 2017 and returned HTC to a mainstream proposition, yet has arrived at the party too late to demonstrate its blatant style and powerful on-trend skills.